The Indian Scout was the only bike I’d been lusting after when browsing the long list of new-for-2015 machines over a year ago. Sure the Scout has a few hitches but the engine is class-leading and the styling has resonated with the current zeitgeist for retro motorcycling. By far my biggest niggle was mismatched suspension (soft forks and oversprung, underdamped rear shocks) but it’s something easily rectified with aftermarket shocks and springs, albeit at a cost of around £550. That’s not cheap, but the modification made a major improvement to the Indian Scout’s riding experience. The Scout’s biggest success is its appeal to a wider audience, not just the usual custom crowd. Having had a few cruisers on long-term test over the years I’ve noticed that the Scout provokes very different reactions. Where sportsbike riders would be completely dismissive of traditional cruisers, the Scout always scored an approving nod on the road and I was often asked about the bike’s performance. That’s something which never happened when I was riding a Harley or a Japanese cruiser. Another feather in the Scout’s cap is its versatility. With leather saddlebags and the quickly-detachable mid-height touring screen, the bike is easily capable of continental trips, as a week-long 2000-mile trip through France proved. Be it luck or good planning, Indian timed the introduction of the new Scout to perfection. But by far my highlight of 2015 was meeting up with the owner of an original 1928 Scout. 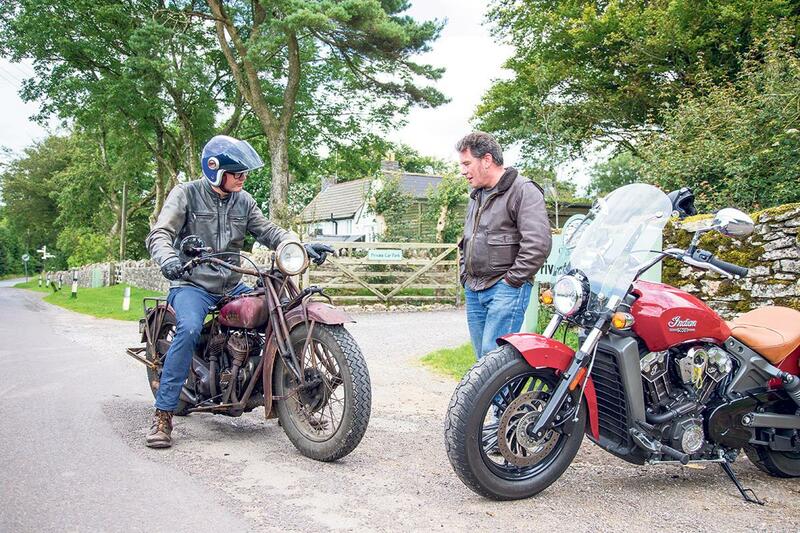 I’m sorry to say I failed to master the old machine’s left-hand throttle, foot clutch and hand-change gearbox but just following the owner as we rode through the Mendip Hills was something I’ll remember for a long time.